Aloe Vera has got lot of medicinal properties. When I came to know that in Rajasthan they make curry with the gel from the thick leaves. Interesting isn't it ? I did give it a try first with rajasthani spices. It turned out very good and wasn't bitter like I expected. 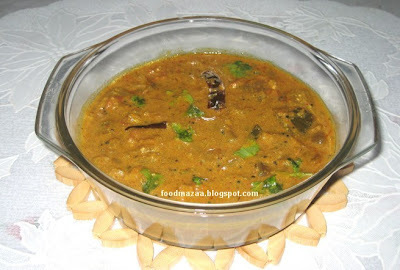 For a change I have now prepared with Chettinad masala and you can see the result is awesome. Tamarind juice ... 2-3 tbsps. Ginger-garlic paste ... 1 tsp. Red chilli powder .. 1/2 tsp. Turmeric powder ... 1/4 tsp. Jaggery ............... a small piece. Cumin seeds ....... 1 tsp. Sesame seeds ...... 1 tsp. Poppy seeds ........ 1 tsp. Pepper corns ...... 1/2 tsp. Dessicated coconut .. 1 tbsp. 1. Peel and cut the aloe vera into small pieces. 2. Boil it for 5 minutes adding salt. Drain and set aside. 3. Heat oil in a pan and fry the onion for 3-4 minutes. Add the ginger garlic paste and tomato.Sprinkle a little water and simmer. 4.Now add the aloe vera,turmeric powder,chilli powder, jaggery, one heaped tablespoon of the ground masala and salt. Also stir in the tamarind juice. Add a little water and cook further for 2-3 minutes. 5.Fry the tempering and add to the curry. Masala looks yummy. Never used Aloe Vera before, dish looks delicious. Asha, aloe vera is eaten like a vegetable only in Rajasthan...for variation I thought why not try with Chettinad masala. Thanks dear.. even I tried it out recently and loved it. Aloe vera curry sounds unique to me...looks so tempting...yum! Wow! curry with aloe vera..lovely..I know it has got lot of medicinal value my grandma used to make some chutney with it..but I never tried it.. When I heard that a curry is made with aloe vera in Rajasthan, I got the recipe from my Rajasthani friend and tried it out. I always had the feeling that it would taste bitter,but it turned out to be like any other vegetable. This time I tried making with Chettinad masala. Hey Shobha, thks for stopping by my blog n leaving those wonderful comments. When i saw dis post, i rubbed my eyes n saw it again...never heard of aloe ki sabzi. However looks like any other vege...never knew one cook aloe. Tats de beauty of blogging... you always learn sumthing new. Yes Chetna,u r absolutely right ... we get to learn so much. Yes aloe vera is generally used for medicinal purposes. I did see your blog ...lovely presentations and nice recipes...will surely see them again leisurely. Hi didi, I see you finally found your way out with the Aloe Vera curry. The one in achari masala, is done by pounding methidana, onion seeds, dhania seeds, jeera seeds and ginger and garlic in mortar-pestle.. then cooking it like any common Indian subzi.. brown onions, then add the pounded masala, then tomatoes, bhunofy and finally add the boiled n drained aloe vera. I hope I recall it properly, but that is how it is basically made. Thanks Poonam..will try it out with the achari masala next time. Thanks for sharing your views.. You can find them in the grocery stores these days. Do give it a try if possible.